For the clean and sober Dovahkiin! Do not upload to the Steam Community or any other websites. I already added it to the Community. Bethesda for creating Skyrim. XRC for the Hi-Res textures. Are you a non-Nord wandering around a frozen country filled with tall people who like to spend their days fighting, singing, starting civil wars, griping about religious figure hating elves and the Empires who were forced into a treaty with them... and drinking so much %#&!ing alcohol you can practically hear their brain cells screaming in agony before their deaths? Are you tired of wandering around needing something to drink that doesn't have any negative effects other than those healing potions you've been stocking up for when you need them? Have you sworn off booze forever because the last time you got drunk, you staggered into an Imperial ambush and woke up in a cart with a rebel Jarl on his way to get beheaded, only to get attacked by a big %#&!ing black dragon?! Are you a Khajiit? 'Nuff said. Well then, this is the mod for you! So I made this mod... I prefer the Dragonborn clean and sober. After all, you'd figure that you wouldn't want to see a person who can shout shockwaves, fire, frost, and whatever else getting drunk. He might wind up wrecking the place! Imagine having to explain THAT to the guards. So, now, if you look behind the counter of every inn, you'll find that, despite their professing intolerence for anyone who drinks the wholesome drink that strengthens bones and teeth, they keep a small supply all ready to be sold... just in case. 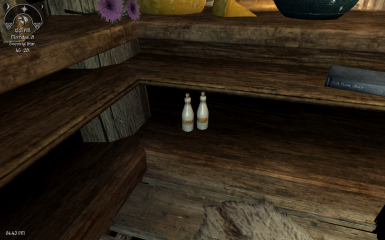 And as an added laugh, I've placed some milk bottles in the houses that you can purchase and in certain other areas around Skyrim... and another place you would DEFINITELY not expect to find milk. Not to mention the dreaded SECRET BARREL OF SHAME!!! If you look around carefully, you might find out that someone just might be a closet milk drinker. The horror... THE HORROR! AND... you will also get the satisfaction that if any of those knuckle dragging Nords calls you a milk drinker, you can say: "That's right! I drink milk all the time! 'Cause I'm the (insert appropriate expletive here) Dragonborn! Got a problem with that? FUS RO DAH!!!" This mod is kind of in it's beginner's stage. I plan on updating to spread the milk around even more. For now, I've only been able to buy it at the Winking Skeever in Solitude, though I added it to the drink list for all merchants that sell drinks. I guess it just pops up in the menus randomly. I'll check on that soon. 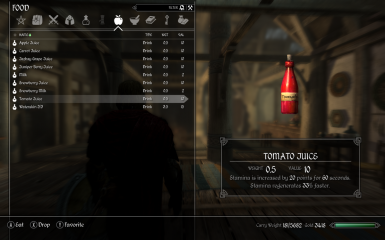 I have now added Tomato Juice to the juice list and the ability for everyone to make their juices at any cooking pot. 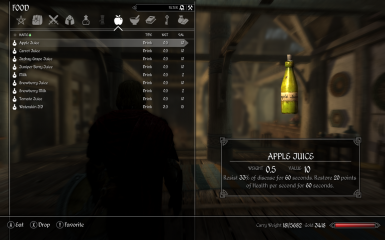 In order to make it though, you will need three of the fruit or veggie and also WATER, which I made available at any alchemist store. I made it an ingredient before, but when I tried to drink it, it crashed the game, so I made it a food item and now it works. And... as a special bonus... I made SNOWBERRY MILK!!! However, you CAN'T buy or loot this one... you have to make it yourself. 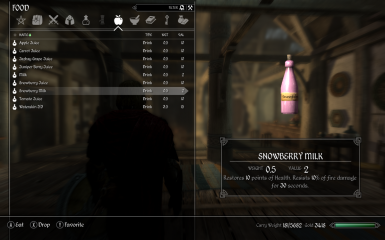 Simple enough... go to any cooking pot with a bottle of milk and some snowberries, and your done. However, the effect of the snowberries get dilluted in the milk, so you only get a small health boost and a little fire resistance. BTW, you might notice when you are making your juices, that Apple Juice is listed twice. Reason for that is that there are actually two kinds of apples, red and green. So I made it possible to make apple juice using either. FINAL UPDATE (NOT)!!! 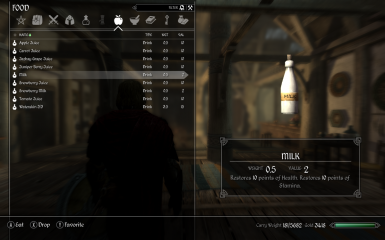 I've noticed that ever since I introduced the juices, the milk had been coming up less frequently in the inns, so I reworked the mod a bit and now it comes up more often. The water is once again available only at the alchemist stores because I reasoned that noone goes to a inn's bar to drink water. And I've added one little extra tidbit... CHEESE! Now you can make your milk into cheese at any cookpot. One bottle makes a slice, three a sliced wheel, and five makes the whole wheel. I've also renamed the Secret Barrels of Shame into Milk Barrels... however, I did keep two of the Secret Barrels in the game and placed them where they should have the most comic effect... at least, that's the idea. 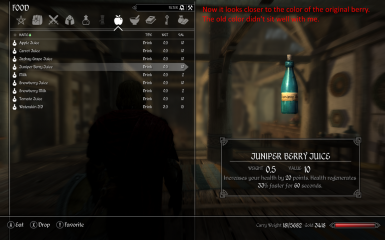 YET ANOTHER UPDATE: Now that Dragonborn has referenced it, I was able to add a tea. 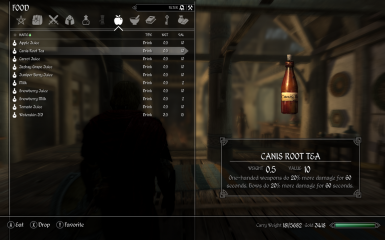 Now you can buy and make Canis Root Tea. AND NOW... there is a mod by Phinix which makes this one compatible with Realistic Needs and Diseases. Download it here. ALSO WORKS WITH... isoku's awesome iNeed - Food Water and Sleep. 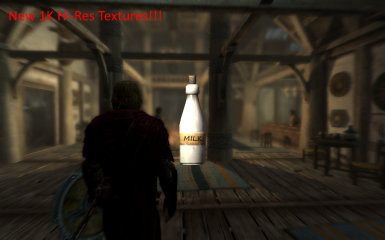 NEW AND IMPROVED... Now there are 1K Hi-Res Textures of the drink bottles. They work with both versions. Thanks to XRC's Unique Booze Bottles HD. AND NOW (AGAIN)... if you want some really AWESOME LOOKING retextures, try quilb's retextures here. ... AND, if you wish... I've even made a version for Falskaar!!! So now you can buy at the Amber Creek Inn there, too. ... and finally, the Legendary Plus Edition for Skyrim, Hearthfire, Dragonborn, and Falskaar! I didn't make a version for Dawnguard, since that DLC only adds two castles; a desolate area full of Falmer, Frost Giants, and Snow Elf ghosts; and a few other places that you won't be buying a drink at. For those with iNeed: iNeed will not recognize the drinks in the newer versions. However, upon drinking a drink, iNeed will ask you to classify it. So when the appropriate message boxes appear, choose "Drink", then "Non-Alcoholic". SMALL UPDATE: It turns out that two of the juices in the mod, while using FrankFamily's Paladin Armor Set and Artifacts was causing the quest in that mod to start prematurely. I've found the problem and adjusted for it. If you have FrankFamily's mod, please download the new versions. Featured on YouTube! In Español!